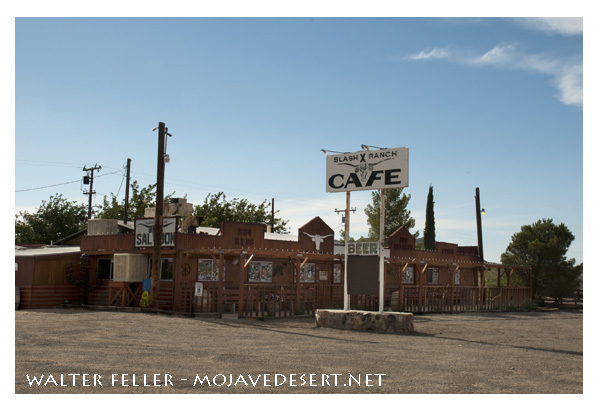 South of Barstow on Barstow Road (SH 247) is the Slash X Ranch and Cafe. The Slash X Ranch was started in 1942 by Lee and Mary Berry. Lee was known as the "Cattle Baron" of the Mojave Desert. At its peak the Slash X Ranch ran about 3000 head of cattle. Mary, his wife, did not want drinking and carousing in her house. So using cowboy logic... in 1953 Mr. Berry and some of his ranch hands built a cafe and bar across the road from the ranch house for the enjoyment of his ranch hands, friends and locals. The logs and beams used in the construction of the cafe and bar were shipped from Oregon. Note the large ceiling beam used inside the original cafe. It was cut from a single section of timber and is believed to be both the largest and oldest solid wood beam in San Bernardino County.